For this unique lampwork necklace I've incorporated some very lovely beads by the very talented Lora McLaughlin of Hurricane Lampwork. 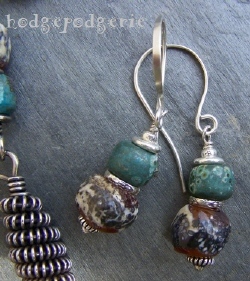 Sprinkled with fine silver and then 'aged', the gorgeous lampwork has a delightful earthy appeal that I simply couldn't resist! The unique and funky lampwork is just perfect for my unique and funky wirework! This great Summer lampwork necklace features one of my coiled wire focals, highlighting Lora's delightful beads. The focal is Sterling silver wire with a small pure copper wire accent. I've given this necklace a slight Southwestern feel with silver beads and flowers by the Thai Hill Tribe folks. The focal is 3 inches wide. 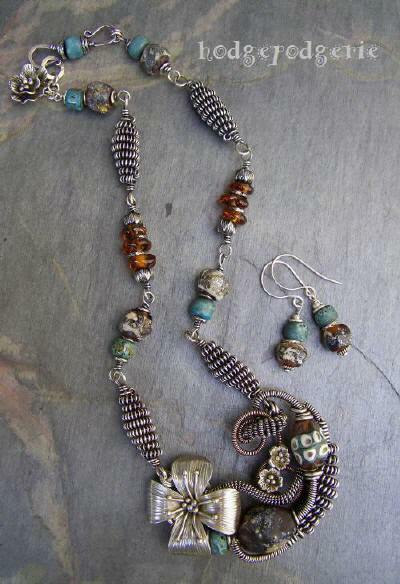 Four wonderful coils make up the chain, along with more lovely lampwork and Hill Tribe silver. For a finishing touch, I've given the entire piece a gentle rich patina. 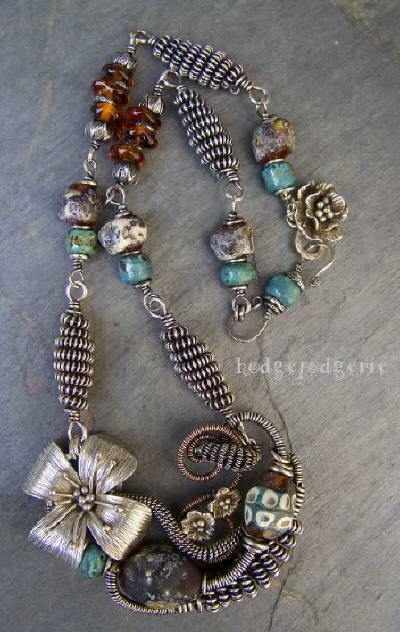 Ancient Musing lampwork necklace is a comfortable 22 inches in length. I've made matching earrings that are 2 inches long. My handmade Sterling silver ear wires are 18 gauge. 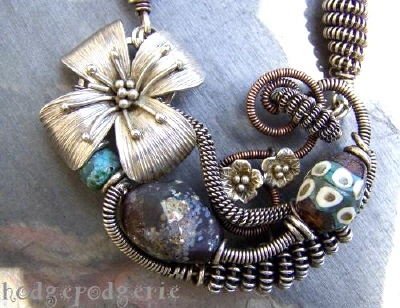 Return from "Ancient Musing Necklace" page to "Necklace Gallery" page.